Once you have uploaded your video assignment to the appropriate location in the Box folder for this course, you will need to take the additional steps of writing a post here and linking to that video so it’s easily viewable by the professor and your classmates. Use these instructions to get the link from Box and enter it into a post here. 1. From within Box, find the file you uploaded, and hover your mouse over the name of that file. To the right of the screen, click on the More Options icon (the three dots) and choose Share –> Get Shared Link. 2. 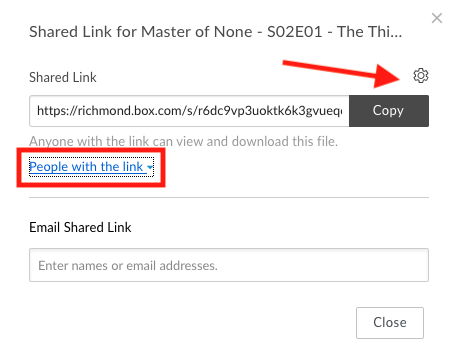 In the Shared Link box, set the access to “People with the link” and then click the Settings icon (a gear). 3. 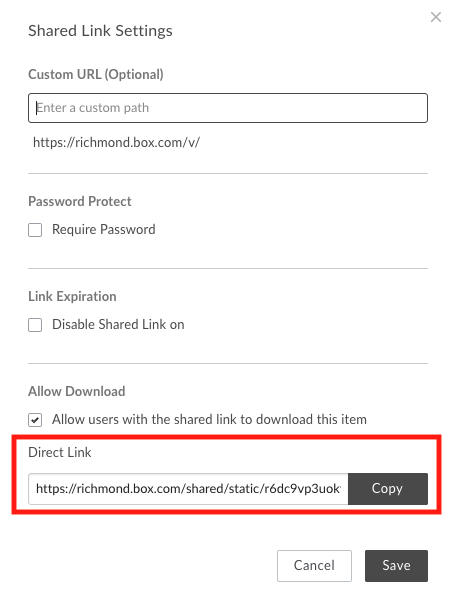 On the new Shared Link Settings window, make sure the “Allow users with the shared link to download this item” box is checked (it should be, by default) and click the Copy button to get the direct link to your file. Click Save. 4. Use this URL to create a hyperlink in a post here on the course site. Video tutorials for creating a post and making a hyperlink are available on the UR Blogs “Get Help” page. Scroll down to the “Creating Content” area to find both tutorials. Please note: videos from Box cannot be embedded using the instructions in the “Embed Video” tutorial, although that may be a helpful reference if you want to embed a video from YouTube, Vimeo, or other major video hosting services.